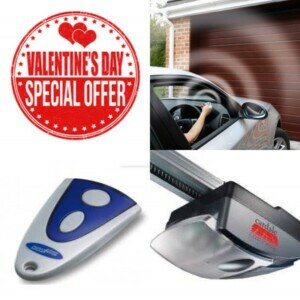 If your partner has green-eyed envy over the neighbour’s electrically operated garage door, or complains about lifting the garage door by hand, then why not treat them to an electric opener as a Valentine present. We will offer a £100 discount on the usual supply and install charge if you call us on 01737 309103 anytime between 8am on the 12th February through to 4pm on the 16th February to book an appointment to have an electric operator installed. Please quote VALENTINE18 to ensure the discount is applied. Note: Your garage door must be compatible – our team will be able to advise you this when you call. Make that note in your diary now to call us!